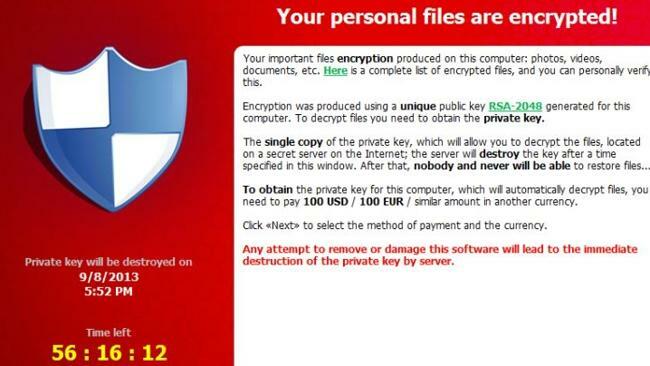 CryptoLocker ransomware virus encrypts your data and holds it hostage – here’s how to avoid it — 1389 Blog - Counterjihad! Once the CryptoLocker virus infects your computer, it encrypts all your files and demands that you pay the perpetrators for the key to decrypt them. It encrypts not only the files on your computer, but also every machine on your local network, including all attached devices such as flash drives and external hard drives. If you don’t pay the perpetrators before the deadline, they will destroy the key for your files, rendering them permanently inaccessible. Removing the virus from your computer and local network does not decrypt your files! Files in cloud storage will also be encrypted if you have mapped the cloud storage to a drive letter on your computer. ONLINE hackers have a new reason to break into your computer – your cold, hard-earned cash. A nasty new virus called CryptoLocker is infecting computers around the world – encrypting important files and demanding a ransom from their helpless owners to unlock them. The ransom note pops up flashing on the computer screen, and the victim is given 72 hours to cough up the casg, or the files will be permanently deleted. A countdown clock indicates how much time you have left to pay the fee. The amount demanded is usually $300, or two Bitcoins (approximately $US260 each). “It systematically hunts down every one of your personal files – documents, databases, spreadsheets, photos, videos and music collections – and encrypts them with military-grade encryption and only the crooks can open it,” a senior security adviser at worldwide digital security company Sophos, Chester Wisniewski, told NBC’s Today program. Once infected, your computer keeps working normally, but you can’t access any of your personal files. It’s terrifying if you haven’t backed up your data. Online forums like BleepingComputer.com are filled with horror stories of people and businesses losing important data and precious memories. A business had 180,000 files encrypted after the virus infected one worker’s computer. The company had to shut down for two days, and eventually ended up paying the ransom fee. So how do you protect yourself and your computer? Aside from caving and paying the ransom, defence and prevention is the only safe method. Thank you for this very good article, it is complicated to prevent this kind of piracy as human behavior is the weakness. 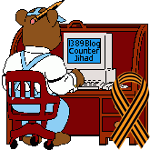 Ransomware has grown even more deadly — 1389 Blog - Counterjihad!